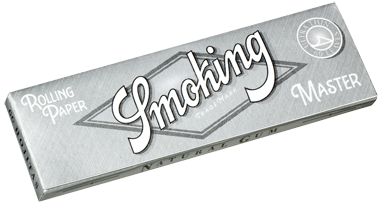 Cigarette rolling papers manufactured in Spain. 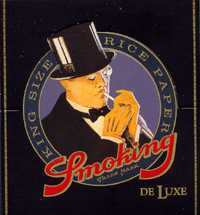 Smoking have been around since 1879 and well worth buying if you appreciate true smokers papers. Box of 3 pre-rolled Smoking brand papers. Carton of 24 tear off rolls of Smoking brand Deluxe Black paper each 2m long (paper is white, carton is black). Rip off any length that suits you. The new silver grade papers from Smoking. This paper is slowburning and ultra lightweight. 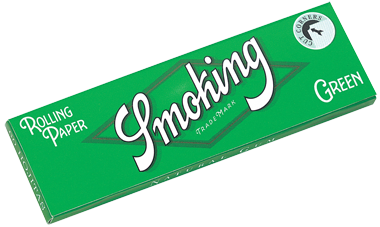 Smoking have been around since 1879 and well worth buying if you appreciate true smokers papers. 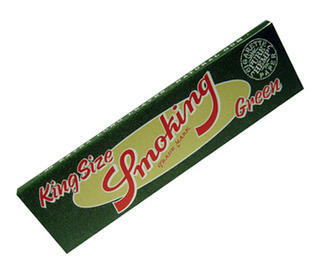 All smoking King size are approximately 110mm long. There are 33 sheets to a packet. 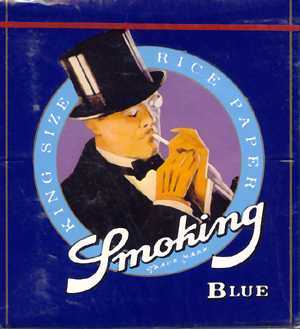 A carton of Smoking Blue Kingsize papers. 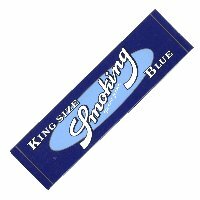 All Smoking Kingsize are approximately 110mm long. There are 33 sheets to a packet and 50 packets to carton. Smoking Deluxe (Black) Kingsize papers. 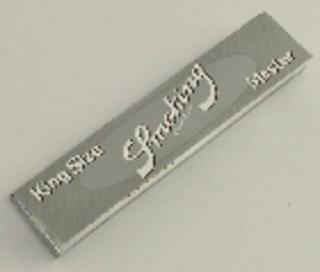 All smoking King size are 110mm long. 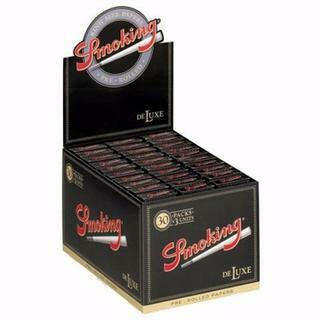 A carton of Smoking Deluxe (Black) Kingsize papers. 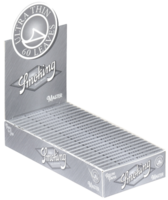 All smoking Kingsize are 110mm long. Smoking Eco are made from pure hemp. 33 sheets to a packet. 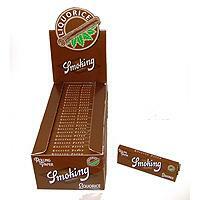 A carton of Smoking Eco Kingsize papers made from pure hemp. There are 33 sheets to a packet and 50 packets to a carton. 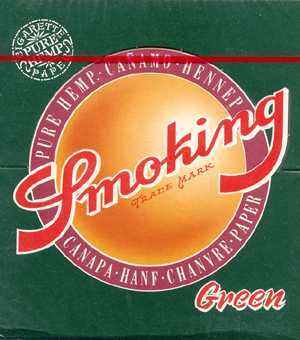 A carton of Smoking Green Kingsize papers made from hemp. 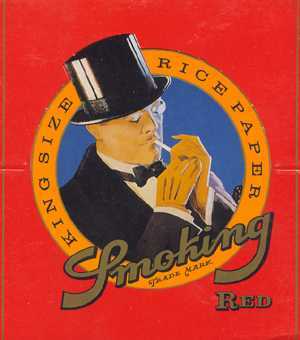 Smoking Red Kingsize rolling papers. All Smoking Kingsize rolling papers are approximately 110mm long. The new Master (silver) grade white papers from MCM Smoking of Spain. This paper is slow-burning and ultra lightweight. Each sheet is only 20 microns thick which is 1/5th the thickness of a human hair. Dimensions of each sheet are 70 x 37mm. 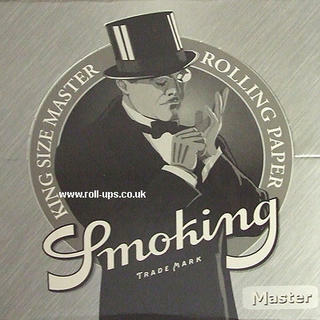 Carton of 50 packs of Smoking Regular (70mm) Master papers. 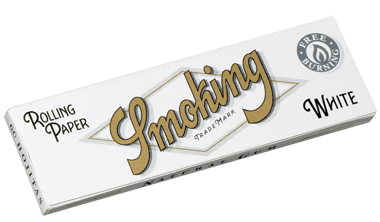 These are the finest smoking papers made at only 20 microns thick, they are 1/5th the thickness of a human hair. Ultrathin, watermerked, slow-burning paper. Contains 60 leaves, size 37 x 70 mm, 13 gr/m2 paper. FSC® certified. One of the first in the market with a sticky tab, which comes in handy for sticking your pack to your favourite pouch of tobacco. All smoking regular size are 70mm long. 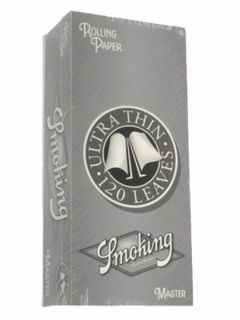 These white "Green" papers are produced with cut corners for easy rolling. There are 60 sheets to a packet. Dimensions are 70 x 37mm. 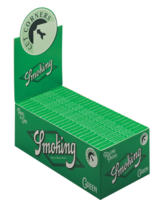 Carton of 50 packs of Smoking Green regular (70mm X 37mm) singles corner-cut gummed papers. Smoking® watermarked and FSC® certified. 100% natural vegetable gum, with no colourings or other additives. The optimum stick with just one lick. White papers are a smooth option for anyone who likes a medium weight rolling paper. Tiny microscopic holes are made by sparks of electricity to allow more air through the smoking paper. This creates a smoother, slower burning smoke.